Long elongated green foliage with white half shaped blooms characterizes the Peace Lily houseplant. The Peace Lily is one of the most popular houseplants. The Peace Lily (Closet Plant) is one of my top 10 easy to grow houseplants. Thriving in lower lighted areas make this plant work almost anywhere. Try to keep it within 5 to 8 feet of a window for best results. Do not place your plant in direct sun. 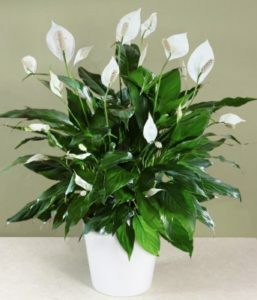 Direct sunlight can damage the Peace Lily’s foliage. If the leaves begin to yellow, it may mean it is receiving too much sunlight. Move it to a less lighted area. The main care requirement for your Peace Lily is water. This plant requires heavy watering, but you must allow the soil to dry out in-between watering to a point as well. This houseplant will let you know when it needs water. The leaves will begin to droop. Allowing the foliage to droop slightly in-between watering has turned out to be successful for me. However, do not let it droop severely. Once the plant is watered the foliage will spring back up. If you allowed it to dry out too much, some of the lower leaves may yellow and need to be removed. This plant also loves higher humidity levels, so providing it with a nice misting a couple times a week will help the plant remain beautifully healthy. The Peace lily is a great houseplant for the houseplant challenged. I guess that’s why it’s so popular as a housewarming gift. The glossy, dark green leaves are offset by white spathes or bracts that enclosing the tiny flower clusters and look almost like variegated leaves. I’ve heard claims that the flowers are lightly scented, but I can’t say I’ve noticed. Still, how many other plants flower in the shadiest of homes?